The Faculty of Electrical Engineering was founded in 1994/95 academic year in Lukavica (today municipality of East New Sarajevo). Teaching process is conducted at the first and second study cycles. The Faculty of Electrical Engineering, as the institution with a long tradition, is recognized by the quality of teaching and scientific research in education resulting in high-quality graduates for the various branches of the economy in the areas of electrical engineering and computer science. There is a constant interest of students for admission to this Faculty. Demand for staff of this profile and good job opportunities after graduation put this Faculty on the list of perspective faculties for which students opt after finishing high school. 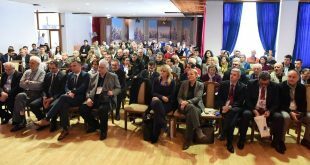 The Faculty of Electrical Engineering of the University of East Sarajevo is the organizer of the international scientific-expert symposium "INFOTEH- JAHORINA," which is traditionally held in March each year. "INFOTEH- Jahorina" is one of the leading national conferences on the application of information and communication technologies bringing together a large number of participants from the former Yugoslavia and beyond. The Symposium is categorized as an international meeting of the first category by the Ministry of Science and Technology of Republic of Srpska. The Faculty of Electrical Engineering of the University of East Sarajevo has developed international cooperation primarily with similar faculties in the region, as well as with related faculties and institutes from the EU. In the framework of the cooperation, exchanges of students and teachers through various activities such as scientific and professional meetings, seminars and summer schools are occasionally implemented.